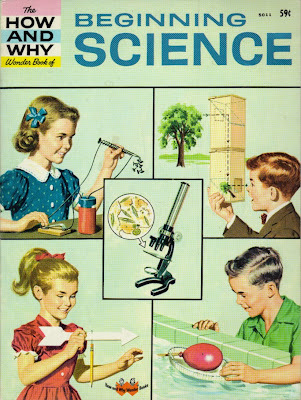 Phil Torrone of MAKE found this page of covers from the 1960s series of How and Why Wonder Books. HOW AND WHY WONDER BOOKS were written mostly in period from 1960 to the early 1970s. These books were aimed at young people. All of them followed a similar format and were written in a form of a question presented followed up by an answer. Virtually all of the illustrations were hand art (not photographs). This page serves to document these books and is provided primarily as nostalgia. The contents of many of the books is quite dated by today's standards (for example the one on the Moon), however it is fun to read through them and see how many of the future predictions were actually realized. There appears to have been around 70 books in this series. So far as I know some were available in hardcover (the vast majority of the ones I have are paperback). As a child I had about 10 of these books and found them to be very enjoyable.